Sixties-style garage rock can really hit the spot. Snotty vocals, amped-up guitars and an attack that draws from The Kinks, Pretty Things and so on can be just the tonic when a sea of tougher to process stuff is drowning everything else out. But unless you’ve been at a million years – cf Billy Childish – or have some spiffy new spin, it’s hard to stand out. Europe is littered with besuited combos with the right haircut. The tack that Les Bof! take is to do it in French. Les Bof! are actually Edinburgh based. Only singer Laurent Mombel is French, aMarseilles transplant. Guitarist Angus McPake is the band’s founder and also plays with the long-running Thanes. All three non-Mombels are also in Preston Pfanz and the Seaton Sands. Nous Sommes is on a German label. This cross-European scene is full of entanglements. 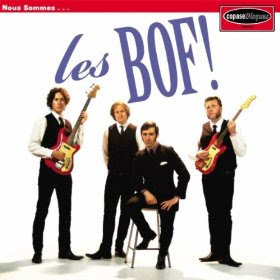 Although French Sixties’ originals to draw from are pretty scarce, Les Bof! have a bit to nod towards. The wonderful Les 5 Gentlemen, from Marseilles, are a combo Mombel no doubt knows about. A lot of early Jacques Dutronc had a garage edge, so did a few cuts by Eric Charden. Ronnie Bird was a short-lived one-man Rolling Stones, and Les Boots were stellar. The covers on Nous Sommes are French-language songs, but not from France: “C'est Fini” was originally by Belgium’s Les Sunlights and "Vivre Avec Toi” by Québec’s Les Misérables. Nous Sommes’ opener, “Rue Marcel Sembat”, reconfigures The Stones's “2120 South Michigan Avenue” with fuzz guitar. “Mon Heure” bolts The Kinks’ “I Need You” to a folk-rock break. “Ne Me Jette Pas” inverts the “Leaving Here” riff as defined by Ron Wood’s early band The Birds and injects a Bo Diddley rave up. The French accent and vocals top it all off with a sneer. Nous Sommes is all wild, all wired, all powerfully expressed. Its 35 minutes are a breathless rush. Bof is French shorthand for “don’t care”. Judging by their sharp look and the attention paid to their chosen sound, the band do care. The name then invites the question of whether anyone should care about Les Bof? Live, they’re no doubt a blast, but their energy is akin to a hamster’s on a wheel, going nowhere. With little added to the stew beyond the language twist, you might as well listen to the inspiration rather than the inspired.